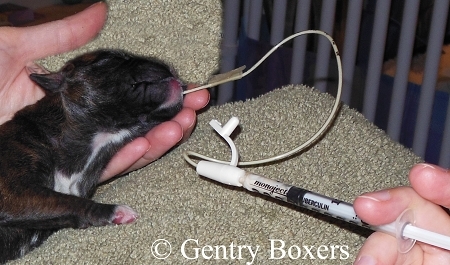 Feeding tube has a closed rounded tip with 2 side ports to dispense liquid into stomach. Made of thermosenstive material, the exclusive Slide-Tex finish makes insertion easy. Recommended by Myra Savant-Harris, author Puppy Intensive Care, Canine Reproduction and Whelping, and Advanced Canine Repro and Puppy Care. These are the tube feeding kits that no breeder should be without and they have become invaluable in my own nursery at Gentry Boxers. I would not raise a litter without this Kit on hand. Instructions for use and supporting video help the novice or experienced breeder learn to tube feed puppies who may need a bit of extra help gaining weight. Use prepared puppy formula or make your own using Myra's recipe (found on page 69 of Advanced Canine Reproduction and Puppy Care and page 47 of Puppy Intensive Care.). (Made with liver water, evaporated goat milk, yogurt, raw egg yolks, mayo or canola oil, Karo syrup and baby vitamins). 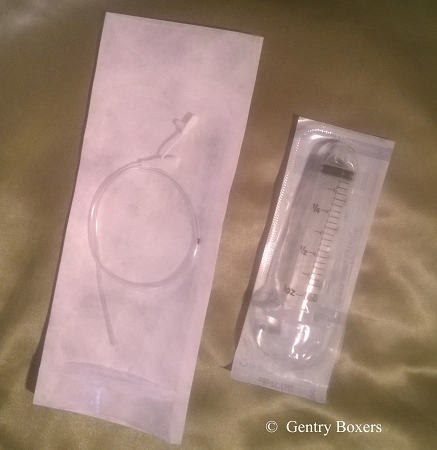 Both the feeding tube and syringe are individually packed in sterile packing and are for single use only. It is not recommended to resterilize equipment. If you are hand raising puppies and they develop medical problems, you will need to contact a licensed veterinarian. I recommend that your purchase Myra Savant-Harris's awesome books to help with critical care and whelping issues for your library before whelping your litter. Read them and be prepared for anything, including orphans or puppies who need extra support. great company to deal with, super fast service, and so very helpful and caring! Highly recommend them. These tube feeders are great ! I ordered the puppy tube feeding kit for my upcoming litter. It arrived nicely packaged and sterile with easy to understand instructions. I would highly recommend this product as it is of great quality! I was so happy to get the tube feedings kit especially after watching Miyra Savant Harris and speaking to mu mentor Paula Vandervoort. It's so easy without the fear of aspiration. I know my loved little ones are getting the very best from me. When your only three and four ounces, feeding is extremely important. Timing,quality nutrition,and consistent quantity is a sure combination for happy healthy puppy's. thank you for the dog breeders store and it's owner??????? ?